Walter Vandervelde is an independent Business Creativity Expert and a pioneer Professor 'Idea & Innovation Management' at the Erasmus University College Brussels. With 30 years of experience in a variety of industries, and his urge to share that experience and knowledge with others, he is a prominent and enthusiastic speaker and trainer who encourages people to fully use their creativity to work on change and innovation. "I’m convinced that creativity is primarily a mindset. In a professional as well as in a private context, it is the way you look at things. The way you embrace challenges, not being satisfied with the first idea that comes to mind, always digging deeper, always being curious." Restraints accelerate creativity, the driving force behind innovation. 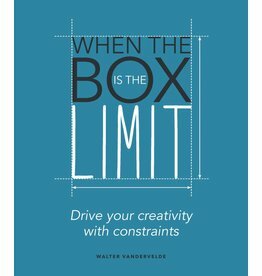 This book provides multiple inspiring examples and techniques on how to use natural or self-imposed constraints to the benefit of creativity and innovation.